The name of Pablo Picasso is, without doubt, one of the most widely known names in the modern world. During the 92 years of his life, Picasso did more to change the meaning and appearance of art than any other person did in the 20th century. He was a rebel. Even though Picasso knew how to paint like other fine artists, he preferred to change things, to paint objects without making them look realistic, and to paint things that people did not always agree on as being “artistic”. 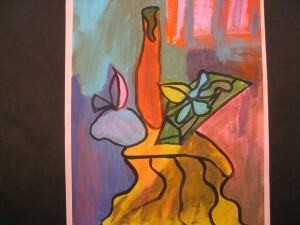 Picasso was an artist who created many different types of art in many different mediums (materials). His enormous body of work included paintings, drawings, engravings, sculptures and even ceramics. In a single day, Picasso was capable of creating six or seven paintings or dozens of drawings, using different styles and always working with complete freedom. He made his own rules. The art in this packet ranges from one of Picasso’s realistic earliest works, painted in 1896, to a work of cubist assemblage sculpture, Guitar. 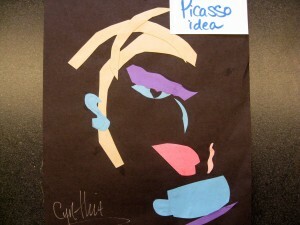 There is one portrait from his “Blue Period” and a portrait and Still Life in “cubist” style. The Dance of Youth is a group portrait, created entirely with line, showing MOVEMENT in an interesting way. This painting, created in 1961, represents some of his work from the last twelve years of his life. Additional Picasso information can be found in Rotation #2, Packet 15. Musicians in Art (Three Musicians), and Packet 19. Cats in Art (Cat Seizing Bird). Other Picasso works included in Rotation #3. Packet 7. Portraits in Pink and Blue (Two Acrobats with a Dog and Motherhood) and Packet 6. Modern Sculpture (Baboon and Young). There is a very simple suggestion for painting a COLOR WHEEL with younger kids included in this packet. If you do not paint a color wheel this month, you may want to save the idea for another month this year. This suggestion requires painting only small dabs of color, without a template to copy off, but it is an organized project, led a step at a time, by you. This idea needs 3 paintbrushes per child. The best way for kids to learn SECONDARY or INTERMEDIATE (tertiary) COLOR is by mixing the colors themselves! Pablo Ruiz Picasso was born in Malaga, Spain, the son of a Basque art teacher. Picasso showed a very early talent for drawing. He studied art, traveling to Paris to learn the styles of the Impressionists and Cezanne. In 1904, he settled in Paris, where he would remain for the rest of his life. From 1901 on, Picasso’s work can be divided into periods, each showing different influences and personal interests. 1901 – 1904 was the Blue Period where his paintings are melancholy in mood and subject matter, flat of form, with strong contour, nearly monochromatic (one color) and of intense blue. The Rose Period (1905 – 1906) offers the same flat forms but with softer contour and more romantic mood, and a delicate pink tonality that is often used with the blue of the earlier works. In 1906, Picasso met Matisse with whom he shared an interest in the works of Cezanne and Gauguin. At the same time, African primitive carvings also influenced him. He did a huge masterpiece called Les Demoiselles d’ Avignon, a painting of five nudes with a small Still Life in one corner, angularly distorted with strong shapes that seem flat but are actually shaded as to be three-dimensional. This was called Cubism. Familiar objects such as vases, tables, etc would be broken down into geometric planes. 1912 – 1915 saw Picasso doing Synthetic Cubism in which bits of fabric or paper were used to build up an image. From 1915 to 1936 Picasso painted in various cubist styles and entered his Classical (sometimes called White) Period. In 1948, Picasso returned to painting themes of women, children, animals and birds. He painted in various ways, blending all the styles he had previously used. His enormous talent, imagination, and vitality add up to an artistic temperament that can be called genius. Picasso’s influence upon modern art has been immeasurable. Pablo Picasso painted unusual and sometimes strange looking pictures. His artwork was Expressionistic and abstract, which means he was not too worried about creating pictures that looked as Realistic as a photograph. But don’t think that Picasso didn’t know howto paint a realistic picture, because you would be wrong! He painted this picture when he was only 16, which demonstrates that Pablo could paint realistic pictures very well, if he wanted to. This painting was so good that it won an important prize, beating out some of the best artists living in Spain at the time. The painting was awarded Honorable Mention at the National Exhibition of Madrid, in 1897. It also won the Gold Medal at the Provincial Art Exhibition, in Málaga, Spain. It was the last painting that Picasso painted according to the rules and advice of art teachers or other artists. He grew up to become an artist who made his own rules. The following year, Picasso moved away from his parents, to Madrid, Spain. He registered at the San Fernando School in Madrid but never attended a single class there. Instead, Pablo spent his time either at the Art Museum (Museo del Prado) or hanging out with other artists in the city of Madrid. How would you describe the MOOD of this painting? What is happening in the picture? 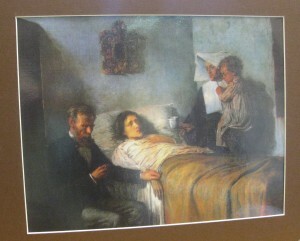 This sad scene shows a sick mother being helped by a doctor and a nun. Notice the pale color of the mother’s face, compared with the faces of the other three people. The woman’s eyes are also very pale. It seems as if all of her strength is gone. The nun is holding the sick woman’s son in her arms. The mother is too weak and sick to hold her little son, who is watching his mother closely. The child looks like a girl because he wears a dress, or a nightgown, but it was common in those days for very young boys to be dressed this way. How do you think the boy is feeling? The boy might feel worried or confused about his mother. What COLORS did the artist use? The colors are dull, dark and sad. 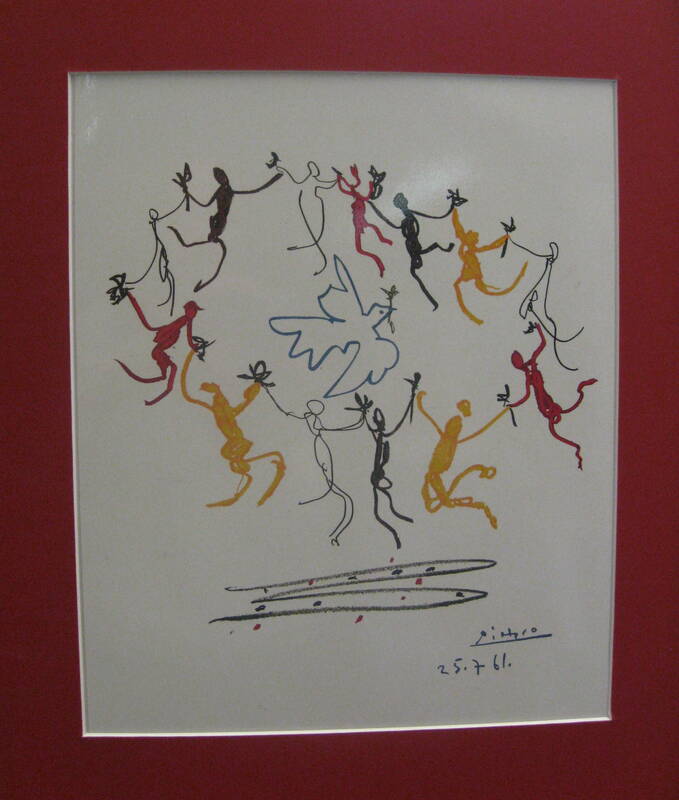 They are not the typical bright, cheerful colors Picasso used later in his life. The colors help create a sad and tragically quiet MOOD. What is the doctor doing? Holding the woman’s wrist and looking at his pocket watch to check the mother’s heartbeat. 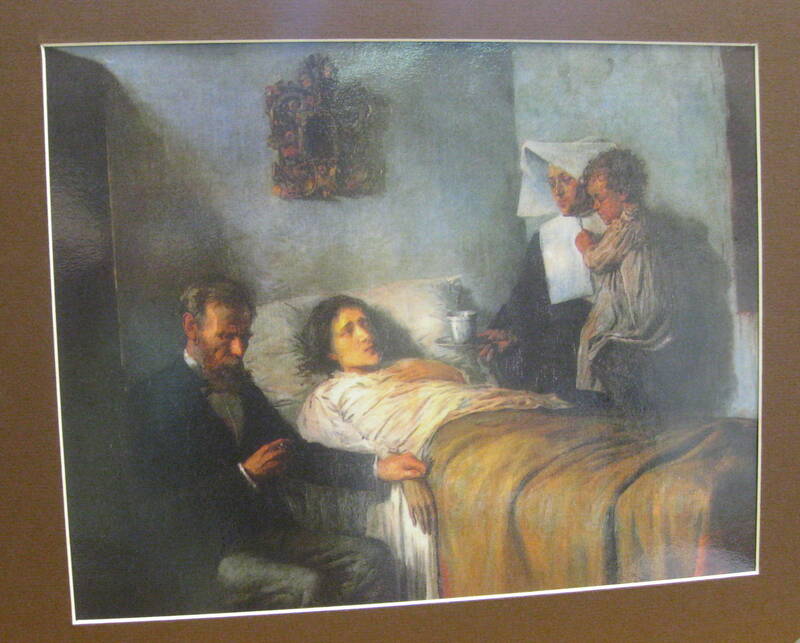 Draw or paint a scene showing a time you were sick at home in your bed, or in the hospital. Include some of the people who helped you while you were sick. Did somebody come in and take your temperature or bring you a glass of water? Add as many details as you can remember about being sick. How did you feel? What types of COLORS could you use to show this MOOD in your picture? When Picasso was 19, he left Spain and went to Paris. Some of the first paintings he made there look a little bit like the work of other famous French artists of his day. Then something tragic happened and Picasso’s paintings became different from anyone else’s. Unfortunately, Picasso’s best friend died and he was alone and sad. At the same time, none of his paintings were selling, he was out of money, and nearly starving. Because of his gloomy mood, Picasso began to paint with lots of blue paint. Blue can be a very sad color. This was Picasso’s first original style of painting and has been called his Blue Period (1901-1904). He made the people in his paintings look lonely, forlorn, and sad, just like he was feeling himself. Many of these paintings depicted poor people. The paintings of his Blue Period remind us of feeling sad and lonely. Some people thought Picasso’s Blue paintings were great! Others, including his father, thought these paintings were just too strange. His Blue Period was the beginning of the artistic controversy that followed Picasso throughout the rest of his unique and creative art career. People either thought Picasso was original and inventive or they did not like his art at all. Picasso’s Blue Period ended when he met a girl named Fernande. 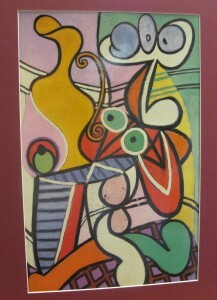 Picasso and Fernande fell in love and soon a happier color began to show up in his paintings—PINK! This was the beginning of Picasso’s Rose Period (1905-1906). This was the name of his second original style of art, when he painted with lots of pink. 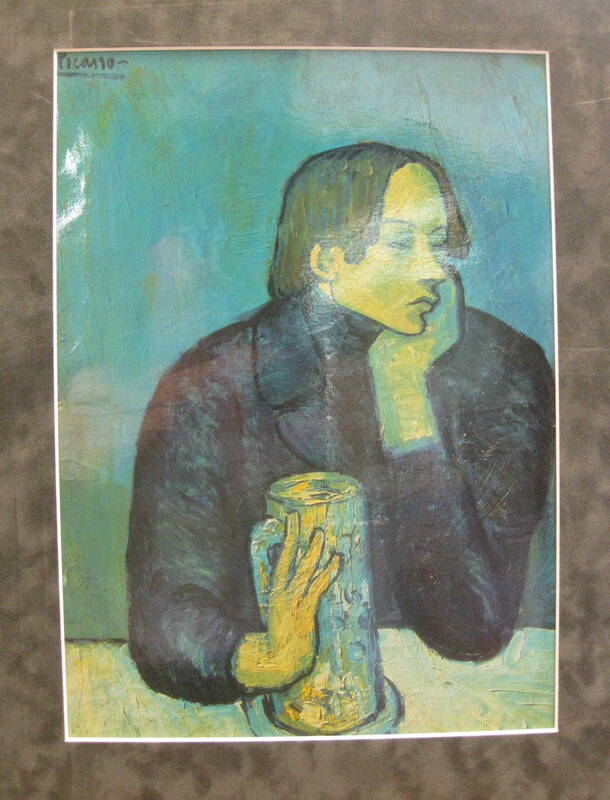 In what period of Picasso’s life do you think this painting was created? What type of painting is this? 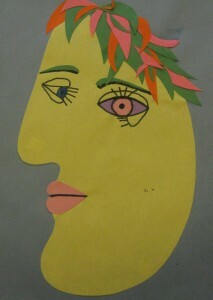 It is a “portrait” a picture of a person. Can you think of any other types of paintings (we have discussed so far this year)? Does this painting have a certain mood? What do you think the young man is thinking about? Is he happy? Explain. If you look closely at the painting, you can see large clumps of paint in the foreground. Sometimes artists want to create a certain look with texture and use large globs of paint applied with a brush or even a palette knife. Draw a “cartoonish” portrait of an imaginary person and paint everything, including the background, with various SHADES (mixing different small amounts of black into the color) and TINTS (dabs of color mixed in white) of blue. Be sure that each area of the portrait has a different blue VALUE (darkness or lightness). Add more or less color to create different TINT VALUES. Add a tiny bit more black each time to create DARKER VALUES of blue. You can also use pure blue to paint an area. Draw a self-portrait and paint it with Tints and shades of orange. What type of MOOD does your finished portrait create? 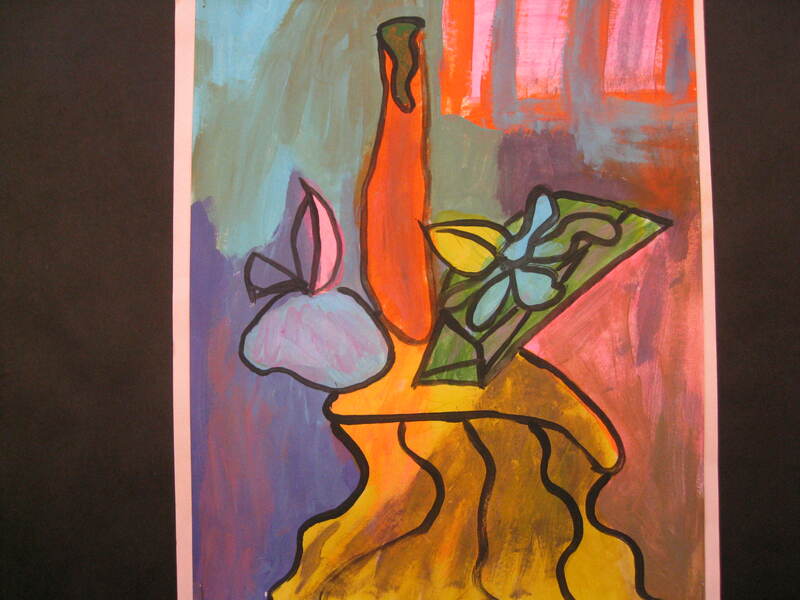 Do you prefer Picasso’s choice of COLOR or the orange color? 3. “Guitar Sculpture” Cut sheet metal and wire. 30 ½” x 13 ¾” x 8” (1912). By the time Picasso was twenty, he began to have a lot of success and soon felt that there was no point in painting or sculpting realistically, or trying to copy nature in a lifelike way. Picasso reasoned that, since a photograph could copy things exactly as they appear, a painting should do something different. He saw that there was no reason to paint like a photograph, since cameras made everyone able to have a realistic picture of things. Picasso knew that when he painted a jug, he could never drink water from it. 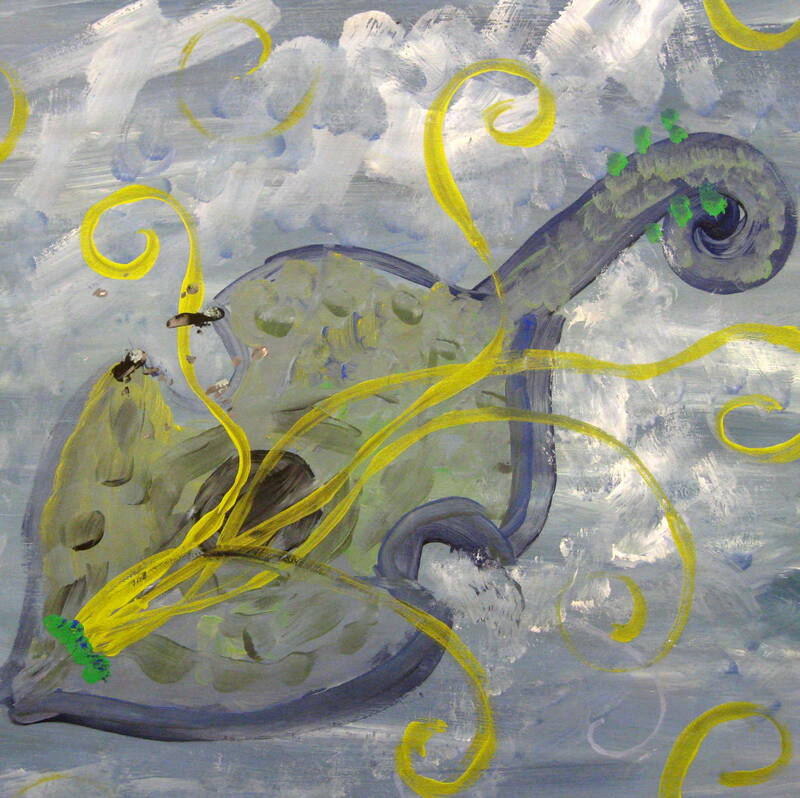 In the same way, if he drew a guitar he could not actually pluck its strings to play music. This led him to feel free to distort the objects in his paintings and sculptures—to stretch them out, simplify, exaggerate or flatten them, and fill in their shapes or forms with strange, unusual colors or patterns. People who were used to more conservative, realistic art considered Picasso’s work daring, some even liked it. Other artists of the time were also experimenting with stretching the definition of art when compared to real life. Some people understood what these artists were trying to do and liked that their unusual work made them “think”. Others still believed that the definition of a great work of art was determined only on how “realistic” it looked. These people felt it was wrong to change the way people had been judging art for hundreds of years. They wondered if Picasso even had the ability to paint “correctly”. Even today, many people do not understand that these modern artists meant to create works that made people “think”, “feel”, sometimes even laugh at the ridicules way things sometimes looked. Picasso especially enjoyed startling people with his new art. He was learning that there were other ways to say things with art than those taught in art schools. The point was no longer to paint “pretty” pictures, but pictures and sculptures that surprised people and woke them up to a new way of seeing. Picasso did not want to create any more pretty paintings or sculptures—just powerful ones! Hold up this sculpture without telling the class its title. What is this object? Could you tell what it was when you first saw it? Does it look realistic? This is an Assemblage sculpture of a guitar. Instead of modeling with clay or carving away material, the artist took sheet metal and wire and “assembled” the material to form the sculpture. Sculpture made by putting separate pieces together to create a whole is Assemblage Sculpture. Assemblage sculpture can be “Full Round”, “Low Relief”, or “High Relief”. Which Classic Sculpture Type was this “assembled” Guitar created with? Part of the guitar form stands out quite far from the background surface, making it a High Relief Sculpture. The guitar is not a “freestanding” sculpture (full round), but has a background so it can be hung on a wall. Picasso has simplified and rearranged the identifiable parts of a guitar to create the sculpture. It is almost as if the guitar has been taken apart and we are looking at the insides of the instrument. Most people need to look at this object just a little longer in order to be sure of exactly what it is. This is one of the reasons Picasso changed the realistic look of a guitar—he wanted the viewer to look at it longer and “see” a guitar in a different and more creative way. Show a picture of, or bring in, a real guitar. How is this guitar the same or different from Picasso’s? Do you like the COLOR Picasso chose for his sculpture? Is there any way you might change the sculpture so you would like it better? What if the artist painted bright colored patterns on the sculpture? What type of pattern might you like? Do you like the way the artist rearranged the different parts of the guitar? The color of the metal does not appeal to most but some like the unusual arrangement of the guitar parts. 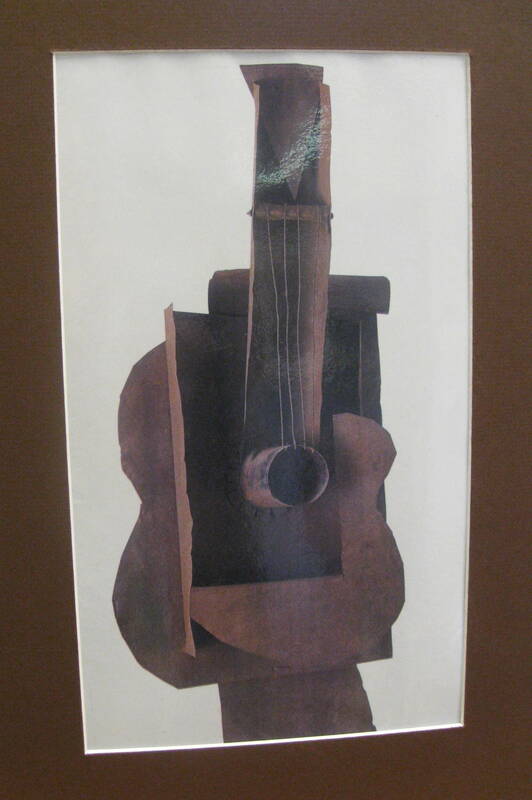 Picasso created his guitar sculpture with cut sheet metal and wire. Create a similar 3-D sculpture using poster board, string and toilet tissue tube. Paint the sculpture with assorted PATTERNS. If you own a guitar, bring it in for the class to sketch. Consider creating a Still Life arrangement using additional instruments and sheet music for older kids to sketch. Sketches could be Realistic, Expressionistic or completely abstract, in a cubist style, with all of the parts rearranged. Use clay to sculpt a three-dimensional guitar or other musical instrument. Rearrange the different parts of the instrument to make it abstract in a cubist way, following Picasso’s different idea. Create a two-dimensional guitar using colored construction paper, cardboard or poster board. Pablo Picasso was Spanish but he lived for more than 70 of his 92 years in France. He was born in Málaga, in southern Spain, on October 25, 1881. When he was a young boy, everyone called him “Pablito”. His father was a painter and art teacher named Jose Ruiz Blasco. Pablo’s mother was Maria Picasso. It was his mother’s name that the artist took and used all of his life. Picasso’s father encouraged his son to paint and draw. He thought his son had great talent and said that Pablo was the one in the family with all the talent. Pablo’s father knew that his son would be famous one day! Picasso usually tried NOT to make objects look real and three-dimensional. Cubism is a style of painting that looks as though objects have been broken apart, mostly into geometric SHAPES. 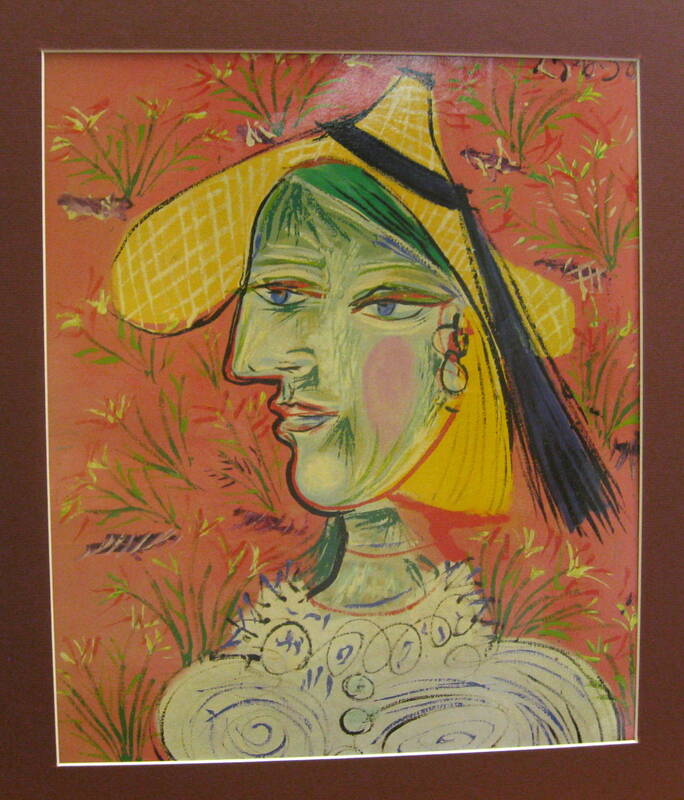 Picasso was primarily the artist who invented this strange artistic style. In this style, things are viewed from all sides, then broken apart and reassembled in an abstract way to show all these views and parts at once. Do not tell the class the name of this picture until you explain this and have them look at it for several minutes, in silence. 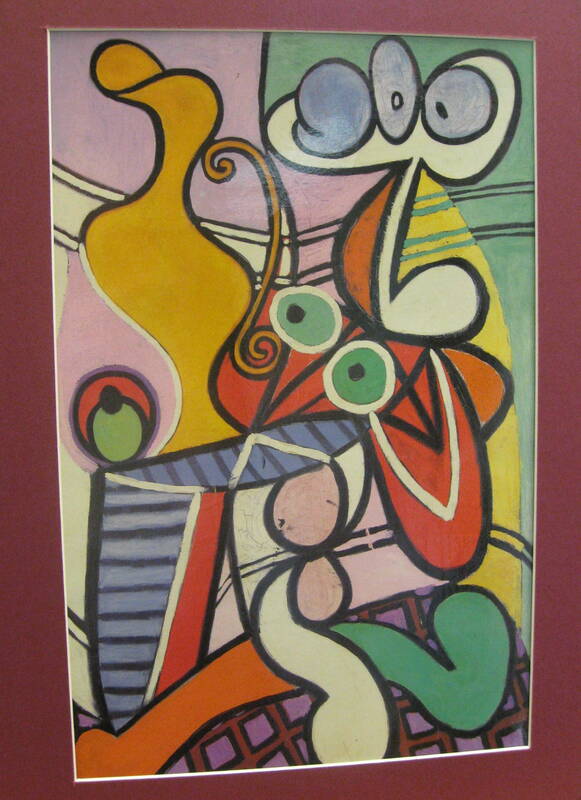 Knowing that Picasso created this painting in a “Cubist” style, do you recognize anything in this picture? Some may recognize the water pitcher. Point it out for the class if no one can see it (left of upper center). This is actually a “Still Life” abstract arrangement. Can anyone tell me what a “Still Life” painting is? An arrangement of inanimate (non-living) objects, often on a tabletop. The artist has rearranged the natural look of things here. This makes the picture “abstract”, since it doesn’t look like real life. Some people might say that this type of picture even looks “cartoonish”. One of the first ways the artist is changing the “natural” look of objects in this painting is showing us what the BACKGROUND wall behind the table, as well as the wall around the corner from the table, look like at the same time. Showing two views at once is one of the techniques used in Cubism. How did Picasso change the realistic look of the wainscoting in this picture? He curved and twisted the horizontal and vertical lines of the wainscoting, the corner edge, and especially both lower outside edges of the wall, to “morph” the wall. The wall appears to have been “melted”. Can anyone find the table in this picture? It is a pedestal table, with three curved legs, which fill most of the lower area of the picture. Each leg of the pedestal is a different color. Picasso has broken the tabletop into three different geometric sections. A striped half circle above the table pedestal is one section of the tabletop. Another section of the tabletop is the small solid color half circle on the far right. The striped, stretched, oval shape on the far left is the rest of the tabletop. Can anyone find the bowl or platter of fruit in this “Still Life”? It is a pedestal bowl or platter, to the right of center. There are three round abstract fruit shapes at the top. Do you see any contour line in this picture? Where? Does this painting have mostly Primary or Secondary COLORS? Set up a brightly colored still life arrangement for kids to sketch. Use a tablecloth with a simple, bold pattern. Tell kids to try and slightly change the shapes of the objects as they draw them. Do not draw much detail, mostly just the outline shape. Kids do not need to change the shapes if it frustrates them. 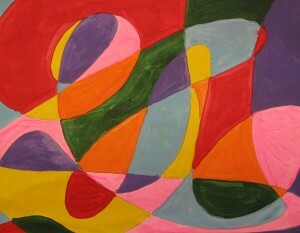 Simplifying the shapes is another way to make the painting abstract. Tell them the key to this is to draw quickly, as Picasso did. Paint the shapes with bright colors and CONTOUR LINE (outline). Make sure there is PATTERN somewhere in the picture (maybe the background wall). It seems that Picasso could draw before he could write—or even talk! When he was very small he would ask for a pencil, which is “lapiz” in Spanish, by repeating “piz, piz”. Once he had his pencil, his parents said that young Picasso would happily sit and draw for hours. Can you find any COMPLEMENTARY COLORS in this painting? What is wrong with this profile compared to my own (student’s name) profile? Be sure kids notice that in a profile only one side of the face is seen. Although we know the other side of the face also has an eye and an ear, we just can’t see the other side of the face. Picasso has shown the eyes on both sides of the profile at once. Rearranging objects, showing parts that the viewer would not normally be able to see because of the view, is part of the style of CUBISM. How would you describe the PATTERN? LINE pattern for the hat. This line pattern should be taught and referred to 4th and 5th grade students as “CROSS HATCHING”. 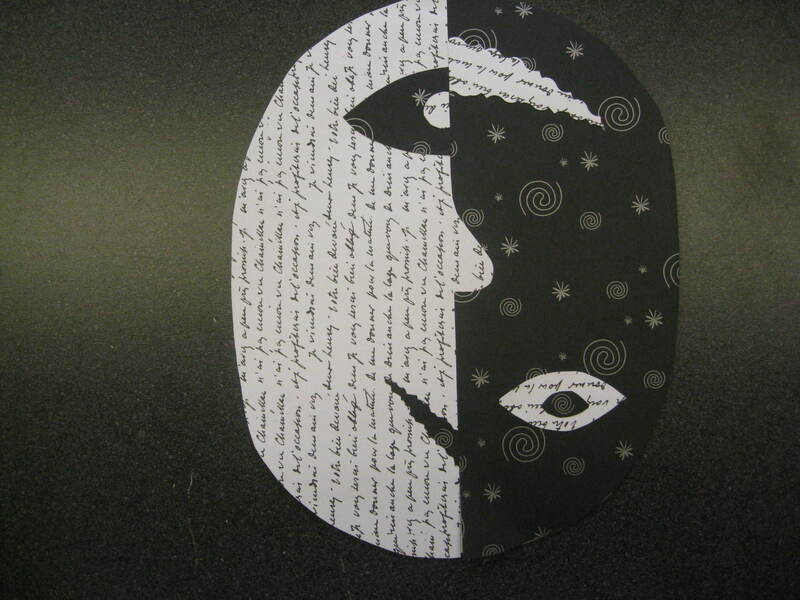 Pair students and have them lightly draw large profiles of each other, which fill most of the paper. Each student uses the profile drawn by their partner to finish as their own. Drawn in the facial details. Rearrange the eyes and/or the mouth on the profile, so that both sides of the mouth can be seen at the same time or both eyes. Refer to this portrait for ideas. Paint with bright color. Fill the BACKGROUND with some sort of PATTERN. Try to create a pattern that is unique and different from everyone else in the class. In advance, go into the class and take photographs of each student. Enlarge these pictures on a full sheet of regular paper (color or black and white). 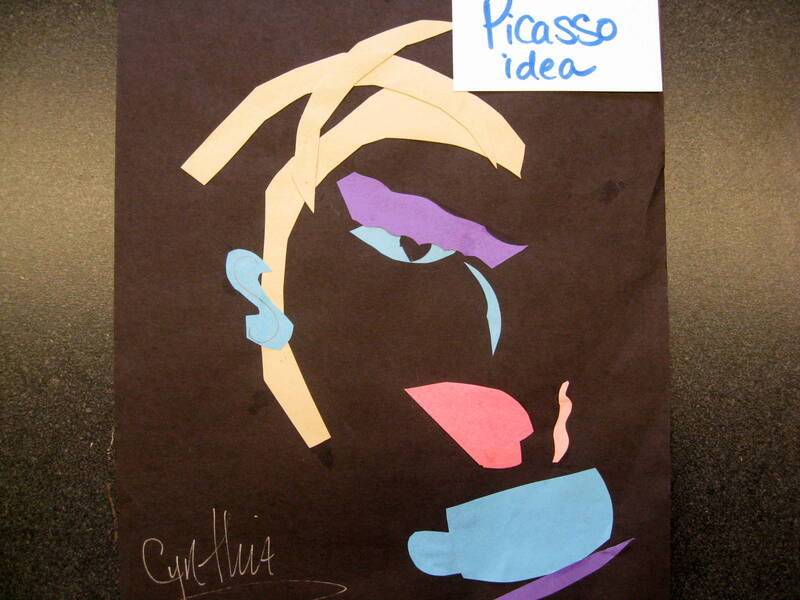 Kids create a CUBIST arrangement by cutting the face into strips or squares and rearranging the parts when glued to a background. Create a colorful pattern on the background paper surrounding the portrait. Picasso Body Collage: Collect “collage materials” for the kids to use (patterned paper, fabric, wallpaper scraps, newspaper, etc.). 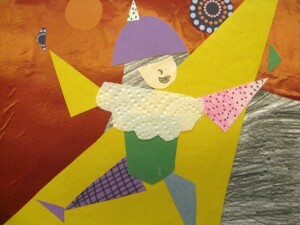 Create “Picasso” collage of a human figure using only geometric shapes for the individual parts. Pair up kids. One outlines the other, who is lying down on a large sheet of white paper. Then together they can cut out and paste colored shapes (freeform shapes can also be used) of collage materials to fill in the body outline. Throughout his entire life, Picasso was very aware of everything that occurred around him—the rapid progress of science and technology, war, peace, festivities, injustice…all of these are reflected in his art. Picasso saw things in a different way. He tried to make his art simple and many pictures he created resemble the art of young children. 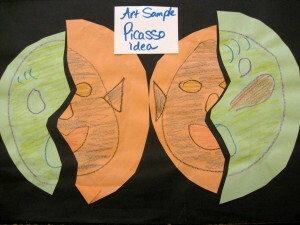 The artist felt that children had the right ideas about art. He liked that young children did not worry about making their pictures look as real as a photograph. He did not like the way older children sometimes lost their ability to create “true” art when they reached the age where they worried about drawing things “realistically”. Picasso thought EXPRESSIONISTIC paintings were truer “art” than REALISTIC ones. The artist knew how to draw and paint realistically, but purposely chose NOT to, because to him “true” art was not realistic art. Can anybody explain, in your own words, what Picasso meant? The artist thought people spent too much time trying to figure out art instead of just enjoying it. He felt that it was the feeling that art gave to the viewer that was most important. Picasso lived until the age of 92. 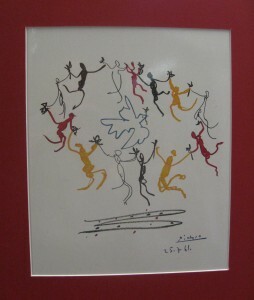 He died in France on April 8, 1973, still vibrantly creative and full of artistic plans. Picasso painted his first dove for a poster about peace for the United Nations. The dove has come to be a symbol of peace today. The artist lived in Paris during both WWI and WWII. Throughout each of these two wars, there were many hardships for people who lived in Paris and across Europe. Getting food and basic supplies was not always easy while the wars were going on. During WWII, the Germans invaded and took over Paris for awhile. There must have been many noisy nights when bombing sounds and battles in the street made it hard for Picasso to sleep. War is not a nice thing and even brave grown ups are afraid of war when battles occur near their home. Can you understand why “peace” may have been an important idea for Picasso? The dove holds an olive branch in its beak, another symbol for peace. Can you see a similar shape where the lines of the circle of children connect to each other? How did the artist create MOVEMENT? Curved and angled LINE in the legs of the “children” Alternating COLOR causes our eyes to move around the circle in an alternating RHYTHM. Use colored marking pen and various LINE QUALITIES to create colorful SHAPE in a picture of similar style, which symbolizes either “friendship” or “family”. You may arrange the lines and shapes with radial, symmetrical, or asymmetrical BALANCE. When finished, label the balance you chose on the back of your picture.